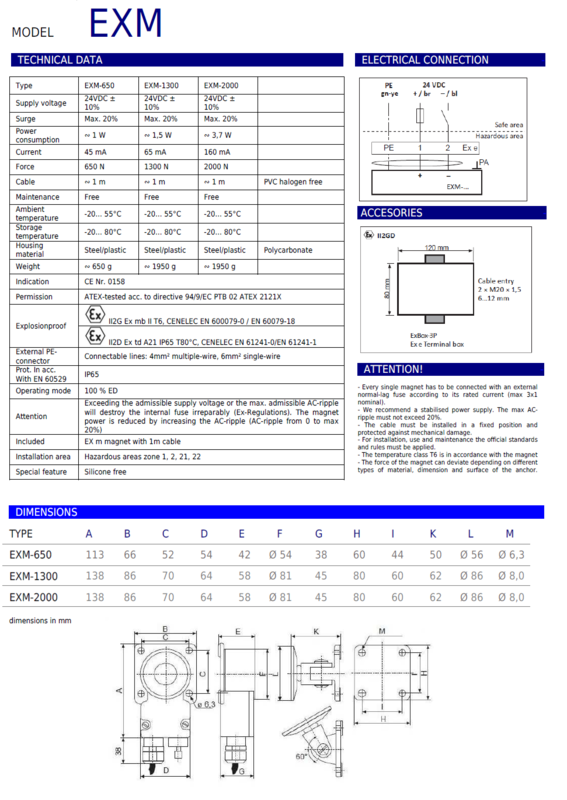 EXM model, explosion proof electromagnetic door holder available with holding force 650N, 1300N and 2000N. The standard power supply is 24Vdc, provided through a 1m cable (optional 5m). The EXM electromagnets seires are certified according to ATEX regulations for hazardous areas zone 1, 2, 21, 22. When the supply voltage is cut off, the magnet loses his force. The nominal holding force of the electromagnet is guaranteed by using its anchor, GH series. It is possible to hold metal objects, different from the anchor of GH series, by checking the holding force. The magnets are certified in accrodance with protecion class II T6 II2G ml Ex 1, 2 (gas, mist, vapour). Ex II2D Td A21 IP65 T80 ° C, for use in zone 21, 22 (dust). - N1 Supply unit 120...230Vac / 24Vdc 0,5A max. I want to receive information on the page "Explosion proof Electromagnet"